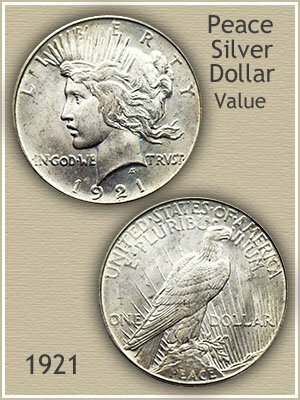 An important first year of the new design, your 1921 Peace silver dollar value shows it is highly regarded by collectors and dealers. High grade 1921 Peace dollars are often the centerpiece of a collection. Your coin is both the start of the series and also a one year "high relief" issue. These coins have an exceptionally deep and boldly struck design, compared to the following years it is very distinctive. As with all old coins, condition plays a large role in determining value. Because of their special striking features it's key to reference the grading images and descriptions below to accurately judge how well your coin has survived. Pictured to the right is an "uncirculated" 1921 Peace dollar. A number of coins in this condition were saved in 1921 because of the new design, and are highly sought by today's collectors. It is often surprising how much these are worth. As you look closely at the two 1921 Peace dollars pictured, a greater depth of design is evident on the left coin compared to the coin on the right. A distinct boldness is notable by the complete rendering of hair detail in the center. The second coin's design is muted by the incomplete strike. Because of what was intended as a high relief design and production problems at the time not all 1921 Peace silver dollars were created equally. The first coin is far superior in depth of strike, and appeal to collectors. Both coins are fairly alike in other areas of grading consideration. Subtle shades of blue and gold overlay nice luster on the first, the second dollar is brighter with less toning featuring a "satin" luster. Luster quality is above average on each coin. Distracting marks and abrasions are minimal as well. 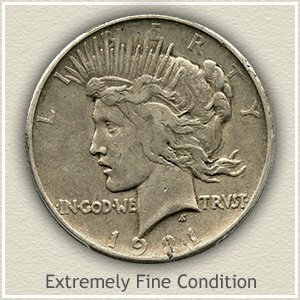 However making a clear choice by collectors, it comes down to strike quality, with the bold strike leading in 1921 Peace silver dollar value. Starting with the image of an "uncirculated" Peace dollar, compare your coin to the grading images to find a close match. Wear from circulation flattens and removes details from the surface. The visual difference separates one "grade" from the next. Although top values are reserved for the "Uncirculated" grade, a lightly worn 1921 Peace dollar is still highly valued by collectors. 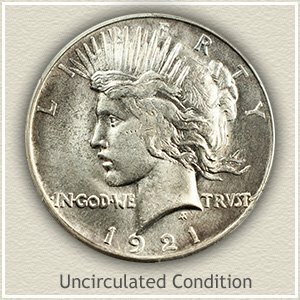 Uncirculated: A Peace silver dollar in "uncirculated" condition must not show any wear to its surface. First to show wear is the mint luster imparted to the surface when coined. Hold your coin by the rims at a slight angle, when tilted back and forth luster rotates across the entire design. Even a short time spent in circulation quickly removes this luster leaving areas dull in appearance. Adding a layer of complexity to grading your coin is the possibility of a "weak" strike. 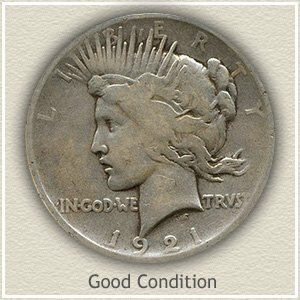 A further discussion of bold verses weak strike of design specific to the 1921 Peace dollar is covered above. Extremely Fine: A slight amount of wear evenly distributed on a silver dollar indicates the "extremely fine" condition. Look closely at the tie of hair at the back of Miss Liberty's head. Although some flatness is evident, a distant roundness to the design remains. Many strands of hair also show in the wisps trailing back from her neck. Overall your coin should demonstrate a nice sharp appearance. 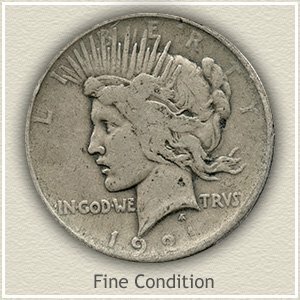 Fine: Moderate, noticeable merging of design is typical of a 1921 Peace dollar in "fine" condition. Obvious wear covers both Miss Liberty and her features and has reduced the original boldness of the lettering. A smoothness and flatting of the once rounded rays rising from the crown is a good indication of this grade. Good: Wide areas of wear and merging of the hairline with the neck designates your coin as "good" condition. Although in a comparatively low grade, 1921 Peace silver dollar value even in this worn condition confirms its collectability status. On the reverse, the eagle is well outlined, however most feather detail is missing. With today's collector admiring these large silver coins, Peace Dollar values are very strong. All have a minimum value of $17.98 with many rare date and mintmark combinations far exceeding the base silver value. Determine how much your old Peace dollars are worth. Check all your silver dollar values with the coin value chart. Early dollars are scarce and highly valued. Morgan silver dollars are a minimum of $18.09 and Peace dollars are now worth $17.98 each. Demand from rare coin dealers, high collector interest and silver bullion value are all positives for your coins. Recommendations on basic supplies that greatly improve coin storage. Providing for safe handling, preserving of value and organizing your box of old coins. Peace dollars a heavy coin, high is silver content and easy to tarnish, needs a certain amount of careful handling to maintain their appeal to collectors. Housing them safely is covered in the Safe Coin Storage article.